MINOT, N.D. – Broadcasting and professional communications major Payton Bland doesn’t necessarily blend into the crowd. 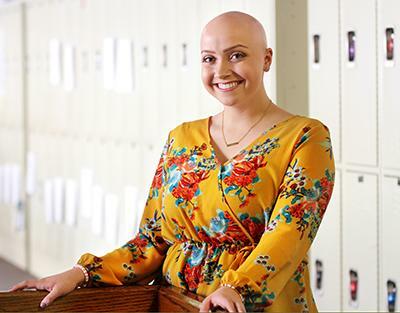 Bland developed alopecia — an autoimmune disease due to a chemical imbalance in the body that causes people affected to lose their hair — when she was two years old. However, Bland doesn’t look at her alopecia in a negative light. She doesn’t attempt to hide her condition, partially because she can help support others by being open about it. One big step that Bland, who is a freshman and only 17 years old, took out of her comfort zone was moving away from her hometown, Mesa, Ariz. to Minot where she has no family. While she talks to her family daily, Bland finds support and comfort through MSU Life. Bland feels not enough students take advantage of opportunities on campus. When Bland graduates from Minot State, she hopes to be a traveling motivational speaker. While still attending the University, she hopes to experience as much as possible.